Waking up to rain is always a surprise in Los Angeles, but a blustery day on top of it? With actual weather knocking on my window and a fresh carton of eggs in the refrigerator I decided it was a great day for baking. I’m getting excited for Thanksgiving food, and one thing I love at Thanksgiving is a good popover. 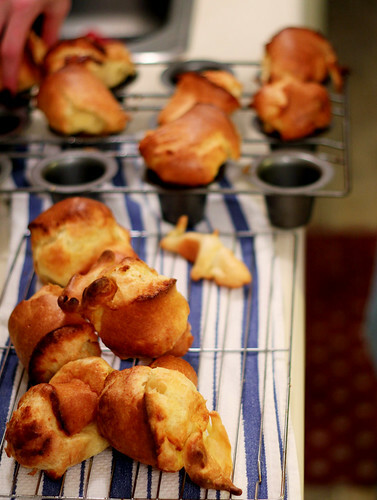 Popovers are airy, crispy golden domes of delightfulness. They are lighter than a roll, softer than a cream puff, but hollow, eggy, and oh so wonderful for sopping up gravy, cranberry sauce, or even the stray piece of pumpkin pie. 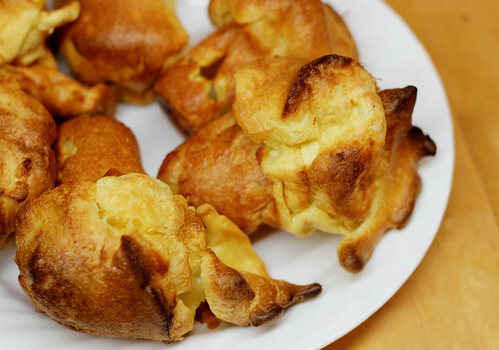 There are specific popover pans available, or you could use individual custard cups to make them. Either way, they are so fun to watch popping up in the oven, and so very tasty, I would encourage all my friends to give them a try. Preheat an oven to 450°F. Spray the wells of a standard 6-cup popover pan with nonstick cooking spray. Pour 1/2 tsp. of the melted butter into each cup. In a bowl, whisk together the eggs and milk, then whisk in 2 Tbs. of the melted butter. In a large bowl, whisk together the flour and salt, then whisk in the egg mixture. Whisk vigorously until smooth, about 2 minutes. Divide the batter among the prepared cups and bake for 20 minutes. Reduce the oven temperature to 325°F and bake for 15 minutes more. Remove from the oven and invert the pan onto a wire rack. Let the pan cool, then spray the wells with nonstick cooking spray, pour 1/2 tsp. of the melted butter into each one, and bake the remaining batter. Serve immediately with butter. Homemade Bagels: The Taste of Redemption! Last-Minute Edible Gifts: A Round-Up Baking Irish Soda Bread for St. Patrick’s Day Have Your Poison Cake and Eat it Too Baking Buttermilk Bread Making Homemade Marshmallows! OMG thank you for this! I’ve been longing to make these. I want to fill them with jam like they do in NYC! Any advice on that? I may need to steal your tradition! We make mashed potato rolls but they’re not as dramatic as these. Gorg! Thanks for sharing the recipe, Megan!